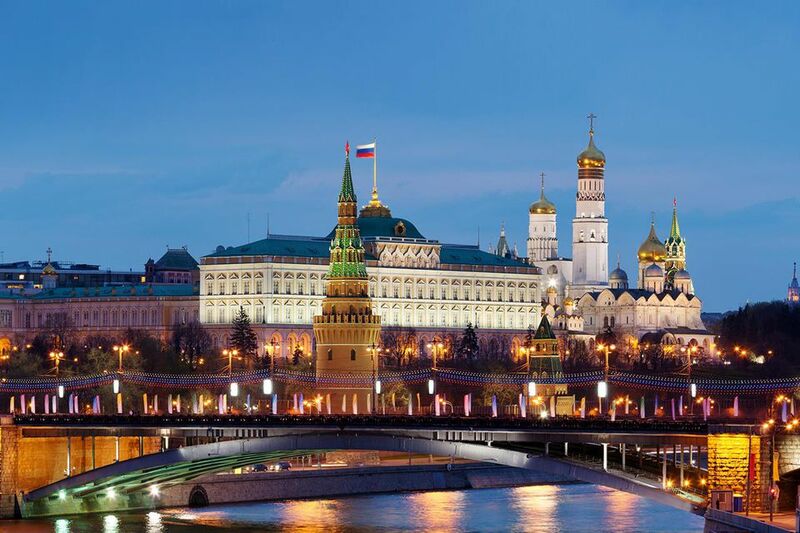 The Moscow Kremlin is the most famous kremlin in all of Russia. Pictures of the Kremlin show a red-walled fortress-like enclosure that holds cathedrals, palaces, government buildings, and some surprising, oversized remnants of the past. The Kremlin, as in centuries past, is the center of government in Russia. But it's also a historic heart of Moscow and one of the city's most important and most visited sights. Visiting the Kremlin should be on every Moscow traveler's list of things to do. There, you can explore the Kremlin's grounds, take photos, view cathedral interiors, and be amazed by museums treasures. Even if you can't make it to the Kremlin yourself to view its historic buildings, you can still enjoy much of what the Kremlin has to offer through photos. These pictures represent the structures found within the Kremlin, and the accompanying explanations tell you why they're important. The Grand Kremlin Palace, pictured between the towers in the photo above, was the official Moscow residence of Russian tsars. Built in the middle of the 19th century, it replaced a palace situated in the same location. Its construction made room for the inclusion of already existing palaces: the Palace of Facets, the Terem Palace, and the Tsarina's Golden Chamber. It is now used for ceremonies and important state receptions. The most recently constructed section of the Grand Kremlin Palace overlooks the Moscow River and appears to be three floors, though the upper floor is actually two stories high. Reception halls make up the interior of the palace, along with the personal chambers of former tsars, such as a study, drawing room, and dining room. From afar, you can see the towers and walls of the Moscow Kremlin. The Kremlin has 19 towers in all (plus a 20th tower that is an outlying tower on the bridge). The wall running between them surrounds the Kremlin's buildings. The Spasskaya Tower of the Kremlin has several interesting details. Built in 1491 by an Italian architect, its gate serves as the Kremlin's main entrance from Red Square — this was once used for ceremonial processions. Sources differ on when the Kremlin clock first appeared on the Spasskaya Tower, and it has been replaced many times over the course of the centuries. The clock you see today on the tower was installed in the middle of the 19th century. The star on top of the Spasskaya Tower is its newest addition — the Soviets added it during the 20th century. The Cathedral of the Dormition, sometimes translated to Cathedral of the Assumption, is one of the most majestic pieces of architecture in the Kremlin's Cathedral Square. Construction began in the latter 15th century, and since that time, the Cathedral of the Dormition has stood as the most important church in Russia. The Dormition Cathedral has seen the coronation of tsars and royal weddings and has been the seat of the Moscow Metropolitan. The interior of this important cathedral is decorated with fine frescoes, and some of Russia's most prized icons were created especially for the cathedral. The Holy Virgin of Vladimir of the 11th or 12th centuries was displayed here at one time, though it is now protected in the Tretyakov Gallery. The Throne of Monomachus, commissioned by Ivan the Terrible in the 16th century, can be seen here. The Annunciation Cathedral hosted the Russian royal families' private Orthodox church services. It was connected to the personal chambers of the tsar. The pristine facade and golden domes of the cathedral make it a picturesque element to Cathedral Square. Ivan the Terrible had the church rebuilt to replace a previous church that stood on the same location. After he married his fourth wife and was prevented from attending services due to the rules of Russian Orthodox, he stood on the porch that was subsequently rebuilt along with the construction of the new church. Icons by some of the most celebrated painters grace the interior of the Annunciation Cathedral. Andrei Rublev, Theophanes the Greek, and Prokhor of Gorodets contributed to the decoration of this private chapel. The Cathedral of the Archangel exhibits some elements of Italian architecture, such as the shell-like forms nestled within the arcade directly under the structure's roof. However, the interior displays are significant to Russian history — portraits of princes line the walls, and an icon of the Archangel Michael is surrounded by legends of its origins. The Cathedral of the Archangel at the Kremlin is packed with the tombs of dead Russian princes. Visitors will notice a special area dedicated to Ivan the Terrible's son, also named Ivan. Ivan famously killed his son during an argument. The scene of Ivan the Terrible shocked at his murder of his son is depicted in a well-known painting by Ilya Repin. For 600 years, a bell tower has always stood at the site of the Ivan the Great Bell Tower. Boris Gudonov ordered it to be heightened so that it would be the tallest building in Moscow. Until the 19th century, no buildings in Moscow were permitted to be taller than the Ivan the Great Bell Tower. The tower was used both as a watchtower and as a bell tower. Twenty-one bells are suspended in the bell tower and at least two dozen bell ringers were needed to set the bells into motion. The Ivan the Great Bell Tower was one building marked for destruction by Napoleon, but his attempts to raze the bell tower failed. In this way, the bell tower has also achieved the status as a symbol of survival under duress. This elegant structure is one of the Kremlin's famous attractions. Both the Tsar Cannon and the Tsar Bell are located nearby. The Tsar Bell is an admirable engineering attempt gone wrong. Cast in a pit in the ground in the early 18th century, the metal of the Tsar Bell was doused with water when workers extinguished a nearby fire. This caused the bell to crack, rendering it useless. The shard of metal that fractured from the main bell weighs over 11 tons alone. The Tsar Bell is still on display just outside the Ivan the Great Bell Tower. Peek into the gap to view the huge clappers intended for the Tsar Bell, and throw in a coin for good luck. The Terem Palace and the Upper Savior's Cathedral are now a part of the Russian President's residence. Therefore they are not open to the public. Previously, they were used by family members of the tsar — the tsarina (queen) and tsarevna (daughter of the tsar or princess). On your tour through the Moscow Kremlin, the cupolas of these churches stand out with their tightly-clustered, golden domes and the colorful towers on which they sit elevated. While the Senate Building, a late 18th-century Neoclassical structure, used to house the government during the last century, it is now the Russian President's residence. The interior has been updated accordingly, but the exterior retains its original facade. Lenin once maintained a study in the Senate Building. The Tsar Cannon, built at the end of the 16th century, is really just a fancy piece of decoration that seeks to impress. The contemporary cannon balls are actually too big to fit into the gun of the cannon. In keeping with its noble name, it is finely decorated with scrollwork and reliefs that transforms this military machine into a work of art. The last couple of decades have seen published images of American and Russian presidents shaking hands in front of the Tsar Cannon. Interestingly, the cannon is a working cannon. Evidence suggests it was fired at least once, though certainly with cannon balls that were made to fit its barrel. The Palace of Facets was once used as a banquet and reception hall for the tsars and their most important visitors. Originally built by Italian architects, it is now connected to the Grand Kremlin Palace. The Red Porch, seen on the left of this picture (and is not actually red today), is surrounded by legend. This staircase was used by tsars on their way to be crowned at the Cathedral of the Dormition. A more gruesome legend tells of how Peter the Great's relatives were thrown down the stairs, where pikemen waited at the bottom to enact their demise. The Red Porch might have been translated in olden days to "beautiful porch." Though it was destroyed in the 1930s on the order of Stalin, the Red Porch was nevertheless reconstructed due to its significance and connection with Russian history and the history of the Kremlin. The Church of the Twelve Apostles and the Patriarch's Palace was one of the latest to be constructed on Cathedral Square and wasn't built until the 17th century. No expense was spared in order to please the patriarch of that time. Here, the patriarch received visiting dignitaries. The Church of the Twelve Apostles was the patriarch's private chapel.